- centrepiece for the new Bullring Birmingham. 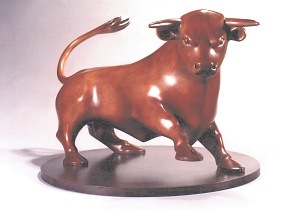 The Birmingham Alliance have commissioned a twice-life size bronze Bull sculpture for the new Bullring Birmingham. 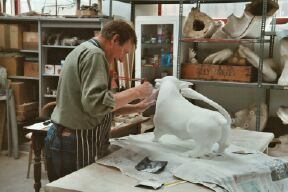 At approximately 4.5 metres in length and about 6.5 tonnes, it will be one of the largest bronze animal sculptures in the country. The Birmingham Alliance, a partnership of Hammerson plc, Land Securities plc and Henderson Global Investors Ltd, are building the £500 million shopping centre on the site of the old Bullring, in the heart of Birmingham, Britain's second largest city. The new Bullring will combine stunning architecture with a series of covered streets on three levels. The 26 acre development will have 132 shop units, making it Europe's largest urban retail regeneration project this decade on its completion in September 2003. The sculpture is to be a focal point and symbol of the area. The Bull has a special place within our collective memory. It has often been used alongside the lion as an animal worthy of devotion and respect that has featured as a focal point and gateway emblem throughout history. 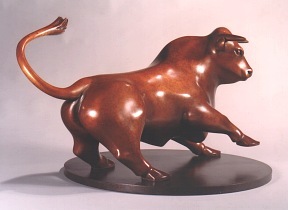 The commission objective is for the sculpture to reflect the characteristics that are synonymous with the Bull: courage, strength, potency, dynamism, movement, determination, nobility, pride, trade and the market place. A worthy symbol and icon of civic pride and spirit. The sculpture is to be sited at the newly created Rotunda Square (still to be named officially) at the junction of New Street and High Street. 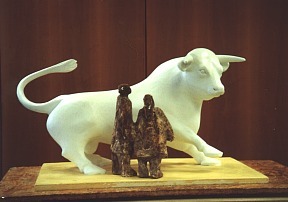 The design is based on the Hereford Bull with its association and historical links to Birmingham. Nowadays the bull tends to appear as a static creature. One only sees it on the move when being teased or now and again, enjoying the freedom of an open field. 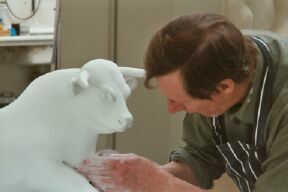 "It was not my intention to create a frightening bull, but a powerful, symbolic sculpture that people of all ages would appreciate, gather around, meet at, touch, talk about and remember." 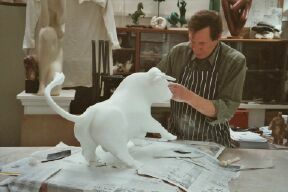 After many sketches, the most suitable was selected for developing a clay model on an armature. Here the three-dimensional qualities can be visualised, on a small scale, to enhance movement. Clay is an ideal medium for flexibility. 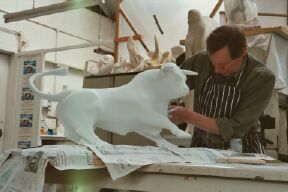 Once the first maquette encompassed all the necessary qualities, it was enlarged in plaster and this second maquette, as shown in these pictures, makes it easier to visualise the sculpture on a much larger scale. Enlarging the sculpture will take between twelve and sixteen weeks. 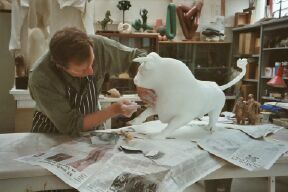 The sculpture will then be cast into bronze taking about twenty-four to twenty-eight weeks. Bronze is ideally suited to interaction with the public, its sensuality encouraging people to touch it, its strength suitable to combat vandalism better than any other material. The alloy of bronze (LG2) is approximately 85% copper, 5% tin, 5% lead and 5% zinc.